The RSI or relative strength index is a popular technical analysis tool that is useful for detecting when a security is overbought or oversold. That is when the price has made a rapid movement in a single direction without a pullback. The real value of the RSI is in predicting when the price may be at a point where a significant correction is due. The measure itself works on the principle of price momentum. A high reading on the RSI means that the price has made more significant upwards advancements over the period. A lower reading on the RSI means the price has made more significant downward movements over a period. The relative strength index is an oscillator and that means its output always ranges between a fixed high and low. The low is zero and the high is one hundred. This makes it easier to analyze different securities on a comparative basis without having to normalize the outputs. The table below gives some output values for RSI and their meaning. An RSI reading of 30 or below suggests the market is oversold. Whereas a reading of 70 or above suggests the market is overbought. Of course, these are generalizations. There are no definitive values that will tell with certainty when a correction is about to happen, because every chart and time is unique. The RSI is a simple calculation of the smoothed moving average of two separate data series, known as the up movements Un and the down movements, Dn. From this, the maximum possible value of the RSI is 100 and the minimum is 0. The period chosen for the RSI determines the smoothing factor of the up and down series. The EUR/USD chart in Figure 1 shows the output of RSI with a period of 14 bars. This is a daily chart so that corresponds to a period of 14 days. Unlike the MACD, the RSI does not always respond strongly at trends where momentum is constant. It produces the strongest oversold or overbought readings when there is a sharp change in the speed of the trend. That is when the price is moving quickly in a single direction. This makes the RSI helpful in anticipating pullbacks and reversal points of trends. 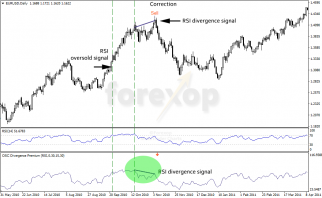 Analysis of RSI is normally just one factor in a trading decision. While the thresholds of the index shown in the table above do give a useful point of reference, it is always worth looking at other data as well. Figure 2 is an example of the complications that can happen. The RSI rises above the 70 line and so produces an oversold signal. However, this is early on and the trend continues to accelerate and to extend higher by some distance before it eventually starts a correction. 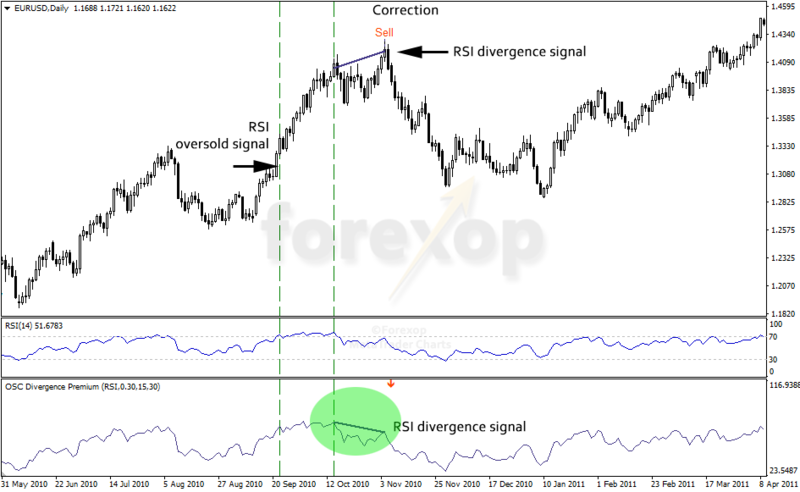 To remedy this problem we can look to the divergence of the RSI as well as the RSI itself. As the figure shows, the RSI divergence does not trigger its sell signal until much later on, until the correction actually begins to take place. 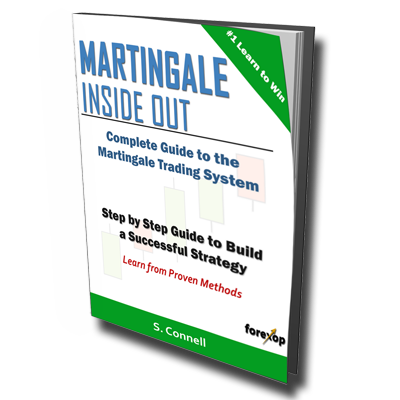 Therefore, in this example using both tools together would have led to a profitable trading decision but more importantly avoiding entering into a losing trade. It is a good idea to look at nearby support and resistance zones as well, because these may offer some indication to whether there will be a stronger reaction as the price enters oversold or overbought territory. 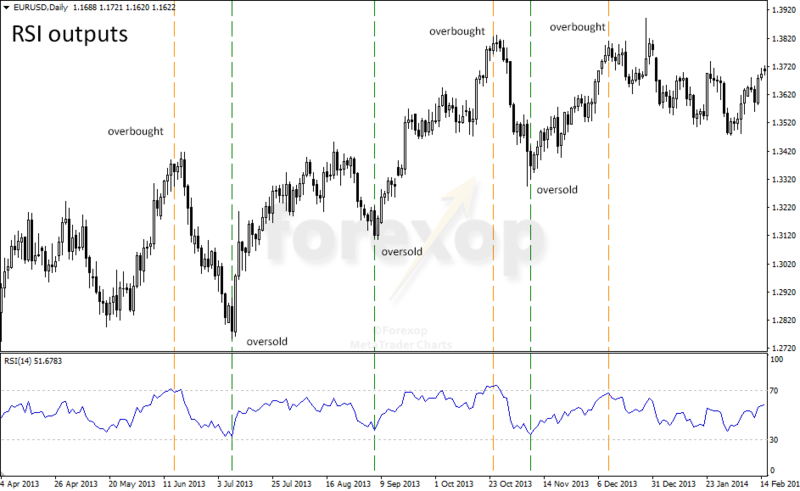 RSI is well suited to range trading. Unlike signals that measure trend strength, the RSI will swing between oversold and overbought levels as the price ranges inside a price channel. This analysis is useful in combination with that of support and resistance lines.